'Twas a bit of a tough weekend for the Penguins, and as you can see in the video above, things boiled over against Keith Ballard and the Florida Panthers on Sunday. Ballard's big hit on Geno Malkin eventually led to a throwdown with Sidney Crosby, who now counts two fights with Florida on his limited resume of dropping the gloves. The Panthers credit Ballard's hit with turning the game's tide, as Florida would end up holding off the Penguins in a 4-2 victory. 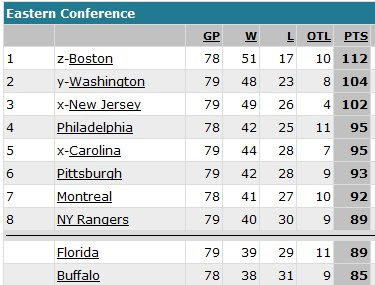 A win would've clinched a playoff spot for the Pens, but that's going to have to wait a while. Instead, Florida gets the coveted two points and keeps their playoff hopes alive. A postseason appearance would be Florida's first since 2000. It was a tough loss for the Penguins, who were coming off an overtime road loss the night before against Carolina. Their fatigue possibly manifested itself with the team ending the first and second periods by giving up goals to the Panthers. But it wasn't like the Pens didn't have opportunities to win the game. They just happened to run into Tomas Vokoun, who stopped 41 of 43 shots from the Flightless Birds in winning his 23rd game of the season. The offense the Pens did get came from Pascal Dupuis, who tied the game at one in the first period with his 11th goal of the season; and Mark Eaton, who scored during a four-minute third period power play that came as a result of Kris Letang getting a Radek Dvorak stick to the face. Unfortunately, the offense generated simply wasn't enough on this occasion. The 42-28-9 Penguins resume action on Tuesday, again in the state of Florida, against the Tampa Bay Lightning, currently found bumbling near the cellar of the Eastern Conference with a 24-37-18 record. That's right, 18 overtime losses. "and now he's cleaning Crosby's clock!" really? biased much? Their announcers are phags and the world knows it. That's what happens when you give car salesmen media gigs. If they didn't have things like scoreboards to prove them wrong, the Panters would be undefeated this season. Also, saying the Panthers held off the Pens is a bit of an exaggeration don't ya think? Considering the Pens played like girls against men in the 3rd period and only got the puck out of their own end when the Panthers got tired of pushing them around.